Coleophora deauratella (red-clover casebearer moth, RCCB) was first confirmed as present in New Zealand during late 2016. It devastated red-clover seed crops throughout the mid-Canterbury region during the 2016/17 growing season but its distribution and control options were unknown. 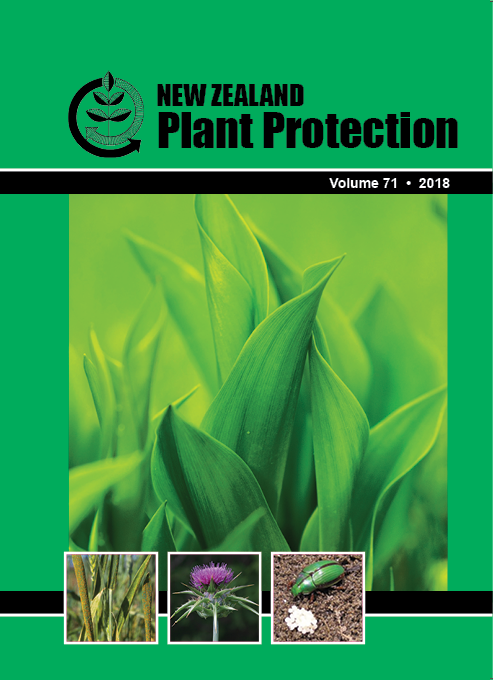 Therefore, traps containing a male pheromone specific to RCCB were located inside either red-clover seed crops or hay crops at 27 sites throughout the South Island and lower North Island during summer 2017/18. Moth numbers were monitored at 7—14-day intervals between November and February. RCCB was confirmed as present at all 27 sites (from Invercargill to Masterton). Peak flights occurred during December with mean moth catch well correlated in thermal time, with half of adult emergence occurring 285Â°C days from 1 July (baseline temperature=12oC). Laboratory-based trials were conducted against live moths to evaluate the effectiveness of various organophosphate and synthetic pyrethroid insecticides. Tau-fluvalinate, lambda cyhalothrin and chlorpyrifos each provided >90% control of moths so chemical control is possible, if required. However, an integrated pest-management control strategy needs to be tested and evaluated.